↑ Sacks, David; Murray, Oswyn; Brody, Lisa R. (2009-01-01). Encyclopedia of the Ancient Greek World. Infobase Publishing. ISBN 9781438110202. สืบค้นเมื่อ 20 April 2013. 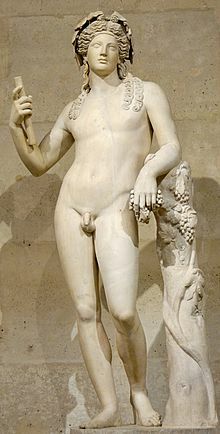 ↑ In Greek "both votary and god are called Bacchus". Burkert, Greek Religion 1985:162. For the initiate as Bacchus, see Euripides, Bacchantes 491. For the god, who alone is Dionysus, see Sophocles, Oedipus the King 211 and Euripides, Hippolytus 560. ↑ Sutton, p.2, mentions Dionysus as The Liberator in relation to the City Dionysia festivals. ↑ Riu, Xavier, Dionysism and Comedy, Chapter 4, Happiness and the Dead, p.105, "Dionysus presides over communications with the Dead". หน้านี้แก้ไขล่าสุดเมื่อวันที่ 21 มีนาคม 2562 เวลา 20:33 น.